Mint has a lot of health benefits. Mint leaves is a herb that is well known throughout the world, especially since is used for a variety of products such as breath fresheners, chewing gum, toothpaste, mouthwash. However, Only a few people realize that mint also has many other health benefits. Mint is a plant that has been used in a variety of cultures, such as India, the Middle East, and Europe. Characteristic of this plant that has a sweet flavor with a cool sensation after eating. Either in fresh or dried, mint can be used to mix the curries, soups, chutneys, salads, juices, and ice cream. Eating mint is good for the body, such as cooling the digestive tract, or if abdominal pain will greatly help relieve the pain. While herbal mint tea drinking may reduce irritable bowel syndrome, stomach cleaning, and also cleans skin disorders such as acne. While cool mint sensation on the skin can help overcome skin irritation. Not only that, mint can also help eliminate toxins in the body and purify the blood by eating them regularly. 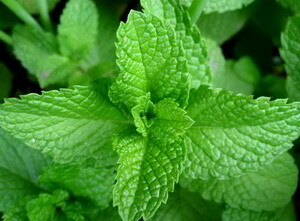 In fact, crushed mint leaves believed to whiten teeth and eliminate bad breath. Mint leaves are healthy entrees. Why? Because mint condition capable of calming the stomach. The aroma of mint activates the saliva glands and the glands that produce digestive enzymes. As a result, our digestion become fluent. To get the properties of mint, pour warm water into the glass along with a few leaves of fresh mint. Take a few moments and enjoy mint tea to cope with stomach pain and indigestion. A refreshing mint scent is a powerful medicine to treat nausea. Smell the aroma of mint oil or fresh mint leaves so nausea is reduced. When applied topically, headaches will also be reduced. The aroma of fresh mint is very effective relief of respiratory congestion by opening up the nose, throat, and lungs. Mint can also help to overcome cough. The use of mint on a regular basis can help people with asthma because it can provide relaxation and help relieve breathing. Mint juice is great when used as a face mask. In addition to the skin, infections, rashes, and acne can also be resolved. Mint can also cope with mosquito bites. This is of course widely known benefits of mint leaves. Because the ability to override the germs and inhibit the growth of harmful bacteria in the mouth, it's no wonder the mouth and breath we'll always fresh if routine use. You can also take advantage of the warm mint to freshen up your leg muscles. The trick, mix 1 cup sea salt, 1/3 cup olive oil, and 6 drops of peppermint essential oil. Rub in the foot a few moments then rinse. Sea salt will remove dead skin cells while menthol flavors will relieve muscle pain. 70 calories, 0.94 g of fat and 8 g of dietary fiber. Mint is high in vitamins, with 28 percent of the recommended daily allowance for folate, 141 percent vitamin A, and 53 percent vitamin C. It is also high in minerals, with 24 percent of the recommended daily allowance for calcium, 36 percent copper, 63.5 percent iron, 20 percent magnesium, 51 percent manganese and 10 percent zinc.